In Portugal, winemaking is often a family affair. From the Douro Valley to Alentejo, from the island of Madeira to Bairrada, Portuguese families of winemakers creatively blend tradition and innovation. In consequence, they produce some of the most exceptional wines in Europe. As they keep the heritage alive, these families also have great stories to tell. 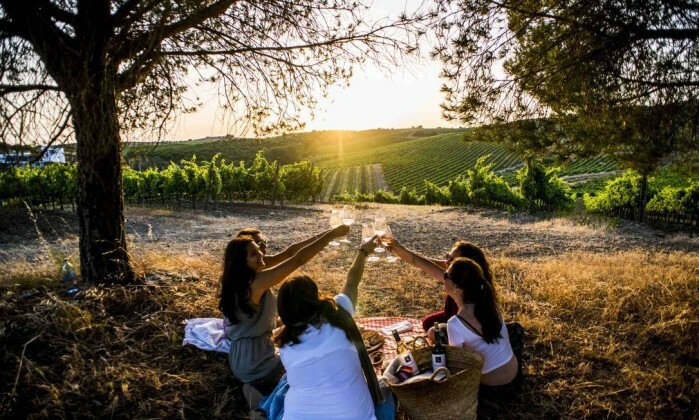 Plan a tailor-made tour in Portugal and discover the variety and quality of Portuguese wines in an incredible journey. You will discover the landscapes, the flavors and the people behind the fascinating world of winemaking in Portugal. At Episode Travel with Art, we will create an itinerary just for you, in a tailor-made wine tour in Portugal that you will never forget! A common denominator to these Portuguese families who were born and bred in the world of wine is their enormous respect for the land and all that nature has to give. Among the vineyards, in the slopes of Douro or the region of Alentejo, each grape is the beginning of a beautiful story , which will end in a glass of delicious, full-bodied red or refreshing white. With Episode Travel with Art, you will be able to experience the magic of the Portuguese wine world. Join our tailor-made tours that will take you directly to the heart of Portugal’s most interesting and iconic wine estates. Many of them, like the beautiful Quinta da Aveleda, have centuries-old manor houses and romantic gardens. You will also discover historic wineries and cellars, take a walk around the vineyards, and learn about the process of winemaking. Portuguese winemaking families are so passionate about their activity that wine runs through their veins, if not literally, at least metaphorically. With a profound respect for traditions, new generations bring freshness to the varied Portuguese winemaking landscape. Many of the descendants of these noble families of pioneering winemakers are now reputed oenologists. They marry the ancestral know-how and experience with new insights in winemaking. In this process, innovation is sometimes just a matter of looking at the past with brand new eyes. In fact, many long-forgotten, overlooked Portuguese grape varieties are being rediscovered. The new generations of Portuguese winemakers are using them to produce exciting new wines. Join Episode Travel’s tailor-made wine tours and we will take you to the most beautiful Quintas, open the doors of beautiful manor houses with their gardens and traditional architecture. Furthermore, we will take you to the vineyards and to the wineries where winemaking is taken to its highest form. To end the day beautifully, join the winemakers in a joyful celebration: a wonderful wine tasting experience in an absolutely unique setting. Because we know this country, and the people who make it so special, we can design super exclusive visits to handpicked wineries for an unforgettable winetasting experience. And of course, you won’t miss an incredible hosted lunch where you will meet the local winemakers. How’s that for an insider experience of one the most special aspects of local wine culture?